I can’t believe that this trip is already coming to an end. It seems like just yesterday we were 16 people crammed into a 14 passenger van, filled with excitement and ready to begin our adventure. We spent today wrapping up a variety of projects from the week. 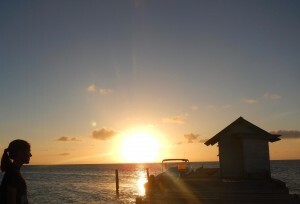 In the morning, we went out onto the fore reef to collect samples to take back to the wet lab. We found many types of algae, crustaceans, mollusks, and other species. 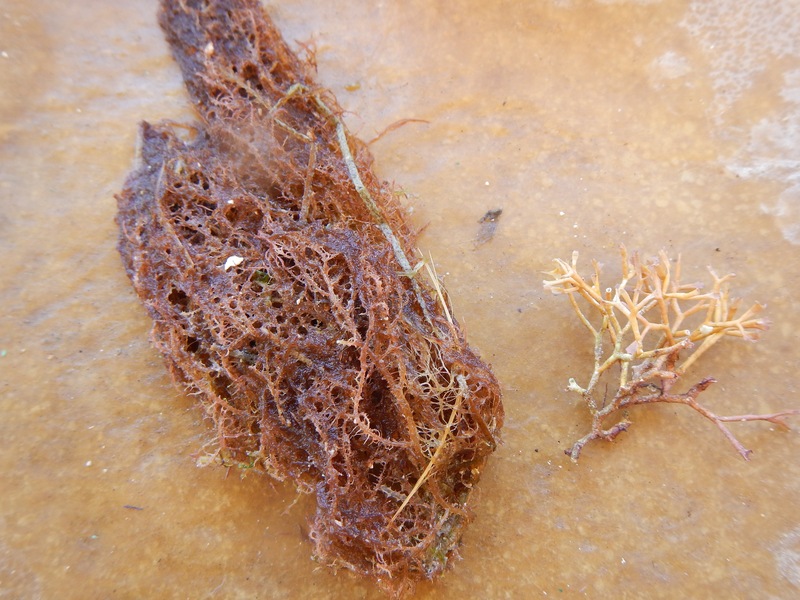 As far as red algae, I saw tubular thicket algae, Galaxura rugosa, and Amphiroa fragilissima. I also found crustose coralline algae growing on the back of a hermit crab. It looks like I’m not going to find a tunicate on this trip. In the afternoon we dissected the lionfish we caught earlier in the week. Ours was a male with a surprisingly large fish in its stomach. After the dissection, we made lionfish ceviche. 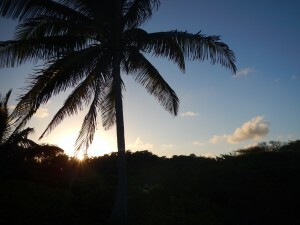 This evening we visited a resort on a nearby island. It was really interesting to hear the stories of other visitors on the island, and we got to watch a spectacular sunset from the dock. 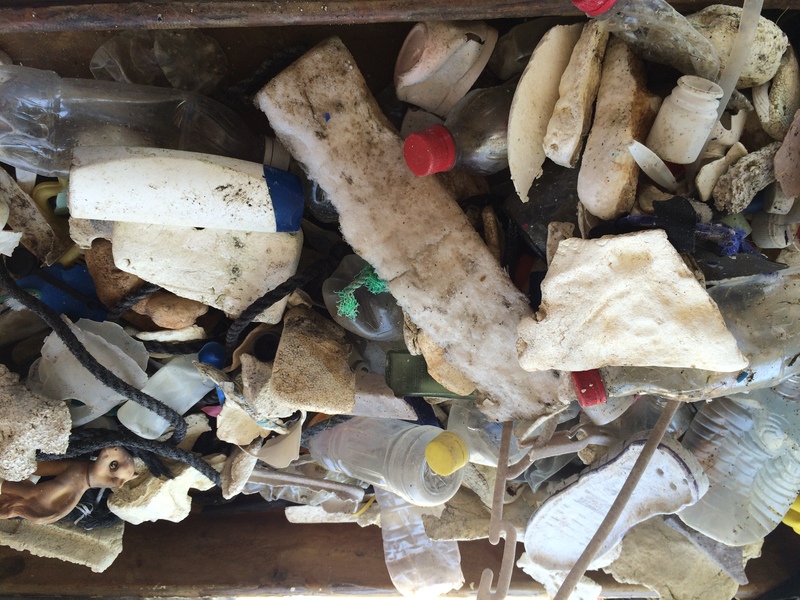 Today we did a joint beach cleanup-marine debris study. We collected over 90 pounds of garbage in an hour, and only touched a tiny section of the island. The amount of garbage that covered the beaches was truly horrifying. The beach is made up of coral skeletons, and from afar it was looked relatively pristine. However, weathered Styrofoam looks surprisingly similar to coral, and in some spots the beach was nearly half Styrofoam. Plastic bags are generally the target of anti-pollution campaigns, so I was very surprised that we found very few. Instead, we found large amounts of Styrofoam, countless bottle caps, shoes, toothbrushes, and even a few syringes and injection vials. 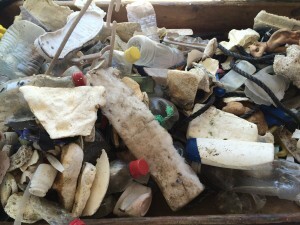 When we returned, we learned that they do a beach cleanup every week, so everything we had collected had washed up less than a week ago. If hundreds of pounds of garbage are washing up on this tiny, uninhabited island weekly I can only imagine how much worse the situation is in other areas. We couldn’t possibly go 2 days without our quadrats, so we took them out to the back reef to take 3-dimensional data on stony coral coverage. The class last year took the same measurements on the same colonies, so it will interesting to see how the colonies have changed in the past year. 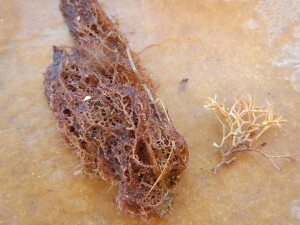 While on the back reef, I saw several species of red algae, including Tubular thicket algae and Amphiroa fragilissima. I also found something that looked like red algae, but it was yellow with pinkish tips. I still haven’t seen a tunicate. I might finally appreciate the vastness of the ocean. This may sound obvious, and I’ve always known that the ocean was huge, but I don’t think I ever really understood what that meant. This morning we went to the fore reef, which was far deeper than anywhere I’ve swam before. Although the water was crystal clear, I couldn’t see the bottom in many places, and in most directions there was nothing but blue for as far as I could see. It hit me that although I was awestruck by the apparent limitlessness of this ocean, I could only see a tiny speck of the ocean on a globe. I know I’ll never fully understand how large the ocean is, but at least now I have some perspective on its immensity. We saw many incredible species today. 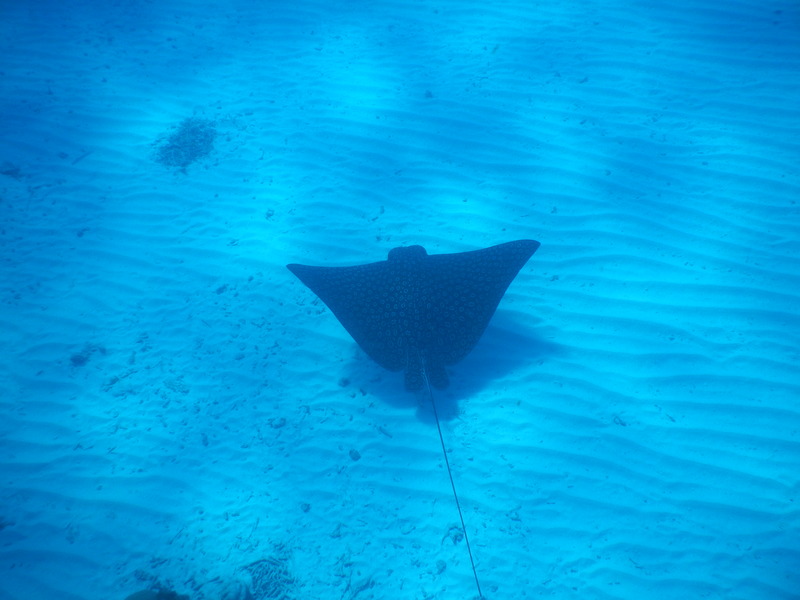 On the fore reef, we saw many large rays, including a spotted eagle ray that was easily longer than I was. We also saw some large, highly endangered elk horn coral. After lunch we snorkeled out to the back reef and saw a large barracuda and caught several invasive lionfish. I didn’t see any tunicates, but I did find nearly all the calciferous red algae species I had researched. Tubular thicket algae and Amphiroa fragilissima were quite common on the sea floor, as they were in the unprotected patch reef yesterdat. I also found crustose coralline algae covering some patches on the reef framework, and a few Galaxura Rugosa plants as well. Today we took a boat out to snorkel a little farther from the station. 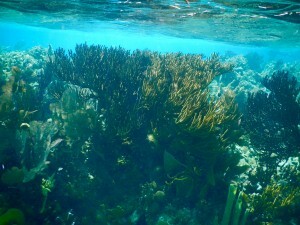 We visited two patch reefs, one in the Marine Protected Area and one outside of it. 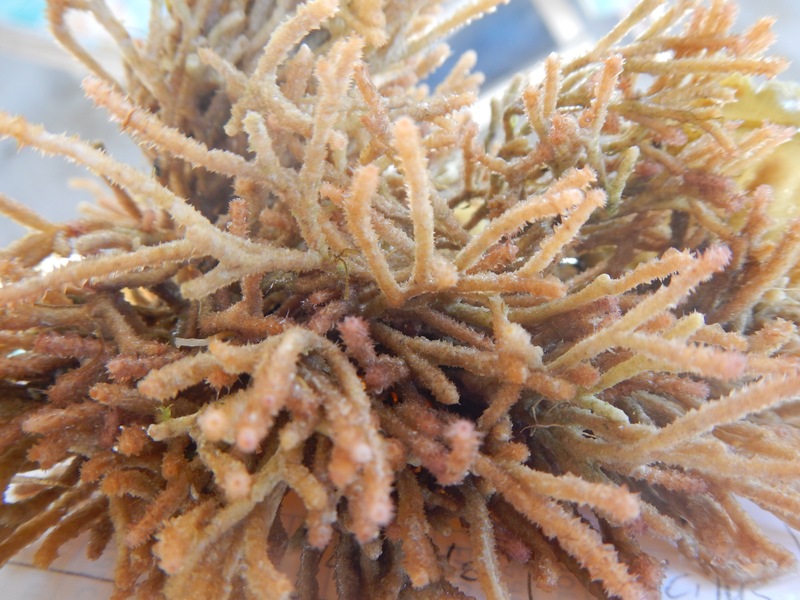 At each reef, we measured stony coral and macroalgae cover to learn about the reef’s health. In addition, we collected sea urchins at each site, to learn about their relative size and abundance. 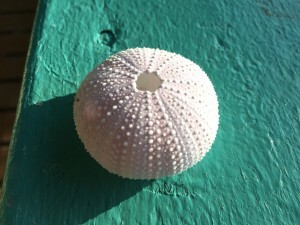 Urchins are important for reefs because they feed on macroalgae, but they also bore into stony corals. If they become too abundant they can do more harm than good and fragment the reef framework. We haven’t finished our data analysis yet, but some differences were immediately apparent. The stony corals in the marine protected area were much larger and denser, and the sandy patches between corals were often bare. 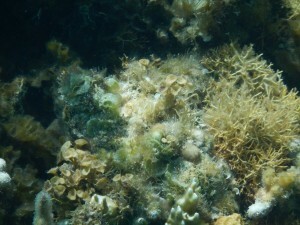 In the unprotected area, large stony corals more spread out and the reef was dominated by soft corals. Most of the area we surveyed was sand rather than reef. These areas were full of sea grass and red algae, contrasting sharply with the open areas of the protected reef. I still haven’t seen a tunicate, but I saw several species of red algae. 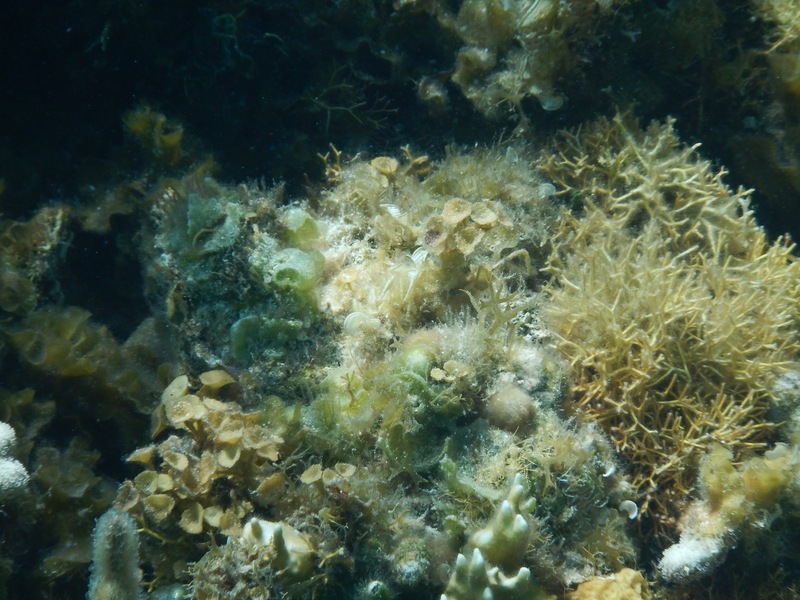 The most common, tubular thicket algae and Amphiroa fragilissima, covered the sea floor in the unprotected area. This evening we put a light out under the dock, hoping to attract some interesting species. We only attracted minnows and shrimp, so eventually we turned off the light and looked at the stars instead. Lying on our backs, watching shooting stars, was easily my favorite part of today. We usually keep pretty busy, and it was so nice to have the chance to step back and fully appreciate this beautiful place in which we live. Day 10: The reef adventures begin! Today was our first full day on the reef! This morning, we swam to a nearby patch reef to see what we could find. The reef is home to such a wide variety of species, from large flounder nearly invisible against the sand to tiny, brightly colored damselfish aggressively defending their algae gardens. It’s a little tricky to distinguish red and brown algae, but I identified Spyridia filamentosa, Laurencia papillosa, and Galaxura rugosa. In the afternoon, we worked in the sea grass beds to practice using transects and quadrats underwater. We set up a 100-foot transect in the sea grass, and then counted the number of green algae plants that we found in our quadrat every 20 feet. We didn’t find any green macro algae on our transect, but it was still good practice for a more complicated project tomorrow. Before dinner, we hiked a little ways to a different beach that was covered in well-preserved stony coral skeletons. We used these structures to practice identifying the stony corals we’ll see on the reef. As we were walking back in the sunset, it really struck me how incredible this place is, and how lucky we are to be allowed to use it. Aside from a small team of staff, we are the only people on the entire island. Glover’s may not have AC or a fancy swimming pool, but it’s far more beautiful than any resort I’ve ever seen. Day 9: Turf to Surf! 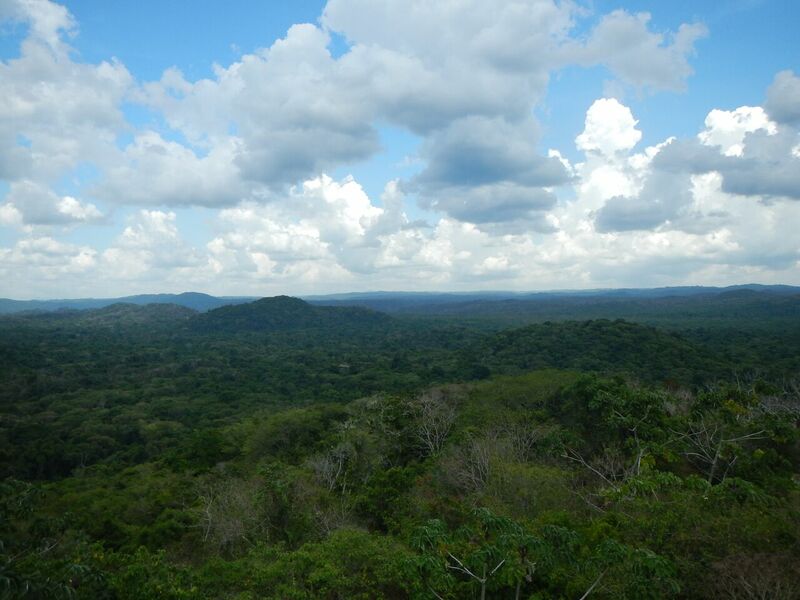 This morning, we went to the Belize Zoo to see everything in the daylight. 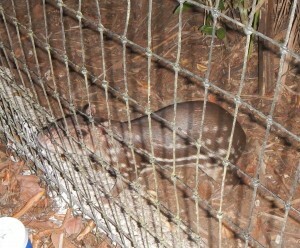 In addition to the animals we saw last night, we also saw a jaguarundi and a harpy eagle. Fun fact: harpy eagles look exactly like hippogriffs from Harry Potter! 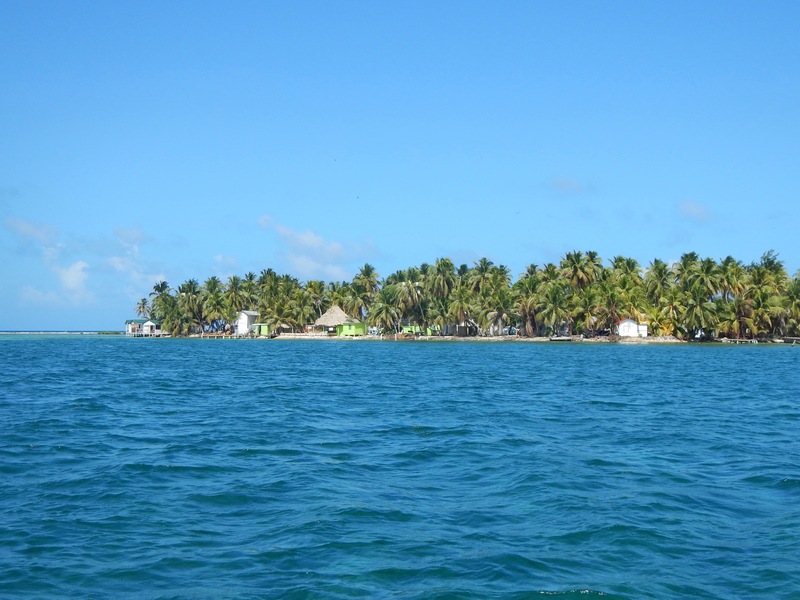 We then drove to Belize City to catch a boat to Glover’s Reef. The boat ride to Glover’s was incredible. As we sped across the ocean, the water flashed vivid colors of blue, teal, and green. At one point, the boat stopped and we couldn’t see land in any direction. The Glover’s research station is beautiful. We are living in cabins on stilts overlooking the ocean. It’s also interesting to look at the differences in resources between Las Cuevas and Glover’s. Las Cuevas had limited generator power, but plenty of water pumped from a nearby cave. Glover’s has 24-hour electricity, but rainwater is the only water source on the island for drinking and bathing. We went for a quick swim before dinner to test out our snorkel gear. I saw several species of red algae, but was only able to identify Laurencia papillosa without my id guide. We also saw a ray and lots of colorful fish. After dinner, we built our quadrats that we will use to do reef research tomorrow. This morning, we got up early for a final hike before our 7 AM departure. At 7:30, the bus still hadn’t arrived. We called to discover that the bus hadn’t left yet, and was 4 hours away. We were scheduled to tour the ATM cave in the morning, but by the time we arrived we had missed our spot and wouldn’t have made it out of the cave until 7. To make matters more exciting, our bus driver decided that he was dropping us off with all our bags at the cave, and wouldn’t drive us all the way to our hotel as we had originally thought. We got a new bus driver, and stopped at a souvenir shop and ate lunch at a restaurant. I tried tamarind juice for the first time and it was delicious! Then, we drove to the Belize Zoo. We went on a night tour of the zoo, which was amazing. 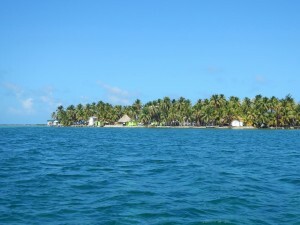 All of their animals are native to Belize, either rescues or animals in rehabilitation. We got to see jaguars, ocelots, pumas, and margays that we’ve been living with all week in the forest, but never actually seen. We got to feed a tapir named Indie, who was confiscated as a baby from the pet trade. We also saw an adorable pair of pacas, which are large rodents with similar size and coloration to baby tapirs. Pacas are hunted for their skin and meat, and hunters often accidentally shoot baby tapirs while hunting pacas. We didn’t do much hiking today, and I didn’t see any termites. Tomorrow I’ll be giving termites a rest and searching for red algae! Today we collected the camera traps that we set out on the first day. It took us 10 hours to set out the traps the first time, but today we were done by 3 while taking a substantial lunch break. It’s amazing what a week in the jungle will do. I didn’t see any new termite nests today, as we were walking a path we had travelled several times and didn’t stop much to poke around. We did, however, see some amazing species on the camera traps! The first photo we looked at contained a bird, but most of the following pictures only captured leaves moving and people walking by. After sifting through hundreds of photos from 11 traps, we had seen 2 birds and a tapir. The tapir was awesome, but I think we had all been hoping to see more than 3 species. We weren’t expecting much from the 12th trap, which we had accidentally set up on top of a massive leaf cutter ant nest. 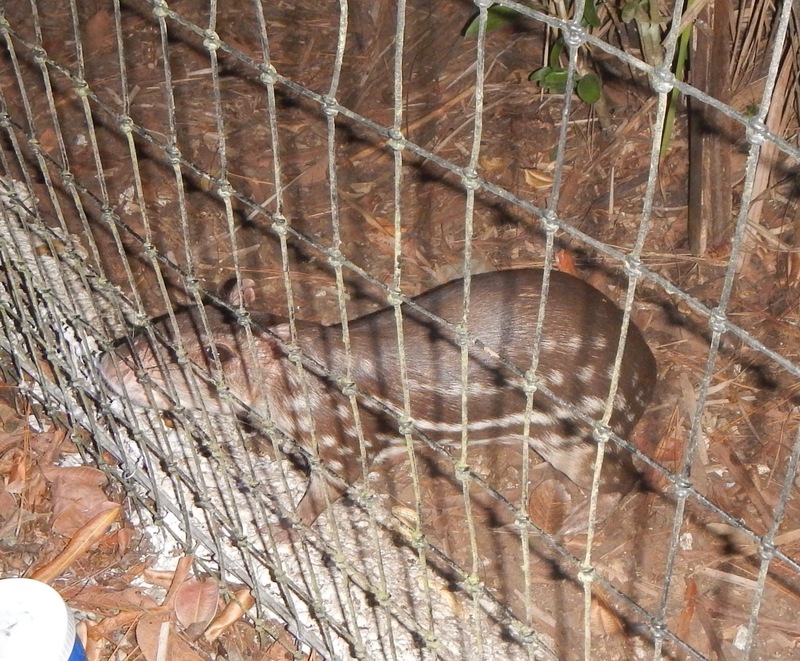 To our surprise, this trap caught an agouti and an ocelot!! Those last photos definitely made the 26 miles of hiking worthwhile. We’ve heard about all of the species in the Chiquibul, but it was so incredible to see these species (almost) in person, and know that they crossed the same path that we did sometimes only an hour before. 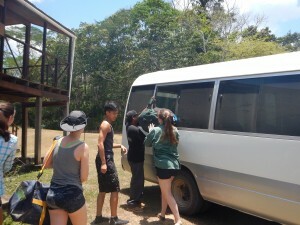 Tomorrow morning, we will leave Las Cuevas. I’m covered in heat rash and I’ve been perpetually sleep deprived, but I feel so complete when I’m here. I have loved waking up to the sound of the howlers and being surrounded by the buzz of the jungle. I’m going to miss this place, but I know many amazing adventures await us on the reef!